Did the greek government prevent a military take over??? bailout plan as soon as possible. prior to casting their votes, CNN affiliate Mega Channel reported. emergency meeting in Cannes, France, ahead of the upcoming G-20 summit. Dow Jones Industrial Average index closed up 178 points (1.53%). bailout deal, an accord that took months to craft. Meanwhile, several senior military leaders in Greece have been replaced. the Athens News Agency reported. Air Force, the news agency said. 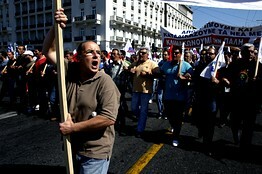 Greece has no more money to pay its civil servants ! The fact that Merkel is now saying something about a “orderly default” one can surmised that this method will be used to eject the other Pigs. We are heading for default and no amount of pats on the head for been the trachers pet will not get you a pass in the comming exams ! Where Greece goes we are heading there too ! tear gas and bashing batons, leaving roughly 300 people injured. Greek debt crisis specifically, and places it within a wider global context. The conclusion is clear: what happens in Greece will happen here. levels than those which induced the debt crisis in the first place. to the uprising in Egypt. their new conditions of social genocide. effects that these ‘structural adjustment programs’ had were devastating. subsidize their agriculture in order to make it cheaper to foreign markets). the countryside and head to the cities looking for work, where there was none. resources while these traitors applause and wallow in their own sense of importance and arrogance.These are the kind of people Cicero warned about! austerity plan in a series of votes this week. social welfare spending and impose a special crisis levy on all taxpayers. beyond,” Almunia said in a speech in London. and a EUR5.9 billion bond repayment on August 20.
fight tax evasion, reduce rates and widen the tax base. politicians are grovelling up to on all fours ! them and at least they are fighting back! If 1929 has taught us anything, it is that a major (capital ‘c’) Crisis poses a lethal threat to (a) currency unions (e.g. the Gold Standard then, the euro today) and (b) political liberalism. The latter threat has, so far, featured only as a projection (see here for a relevant argument), rather than an observed reality. In a recent post I argued that the EU’s recent demand that Greece’s assets be privatised by a junta of foreign officials was the first step toward the dismantling of the EU’s basic democratic principles. Today, in this post, I warn about an even more radical threat, this time to basic liberal tenets about the rights of private citizens. My warning will take the form of a true story, to which I am an eyewitness. It should, I submit, send shivers down the spine of all European (small ‘l’) liberals. Precisely because this is a seriously worrying tale, I shall include no commentary: just a blow by blow account of facts. My tale begins about nine weeks ago. 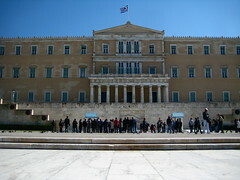 From April 2010 till nine weeks ago, I was a regular invitee on public TV and radio (ERT, the Greek public broadcaster). Ever since my criticism of the government’s policies intensified, about a year ago, every time I went to the ERT’s TV studios technicians would approach me in disbelief that I was still being invited. I paid no attention, even though their incredulity was becoming louder and more intense. It was around March when the CEO of ERT called me to his office to announce that he wanted me not only to appear regularly on their TV current affairs programs but also to present my own program after the main news bulletin, offering a running commentary on the unfolding crisis. His kind offer made me think that the technicians’ musings were verging on the paranoid. Though accepting his offer would entail a huge workload, I promised to send him some ideas on the matter; which I promptly did. reports of at least one injury. country has promised its international creditors. its European partners and the International Monetary Fund. support among his party’s rank-and-file. operating on skeleton staff and postal operations were suspended. and pharmacists also staging their own walkouts. cover its borrowing needs for the next three years. program before they disburse any fresh aid to the cash-strapped country. fail to implement the austerity package. equivalent German government bonds since the launch of the euro. —Terence Roth in London contributed to this article. We in Ireland should watch as this is our final faith, Greece is been sold off piece by piece ,but at least the Greeks have the balls to get up and fight ! We in Ireland are going to have to leave the euro or get booted out. The powers in Europe are ignoring us because the politicians that we have elected are nothing more than mouthpiece for them .They are bought and paid for with lucrative jobs in Europe and lottery pensions. There is no opposition here in Ireland as the unions are also part of the status quo. The last time Jack o Connor called a demonstration he was himself booed off the stage as the demonstrators realized they were been used by the unions to enforce the coke park deal that would only save the jobs of the chosen few and keep themselves in their plush jobs with enormous salaries ,that are many times the average wage. No my friends we the ordinary people must take action ourselves and we must become vocal and present on the streets. That’s right we must stay on the streets to keep the crooked politicians in cheque as they are already selling off our country to their buddies .will we wait until we have to pay to bring our children to the local forest, Yesterday a call went out to the local authorities to privatize local services .the health board got the same instructions. I bet that every government department got the same instructions sell off anything you can, cut services and introduce new charges .So much for no new taxes.